Although Canada is home to immense natural gas resources, with upwards of approximately 1,700 Tcf of reserves, the country’s export market to date has been limited to a single dominant consumer, the United States. In 2017, over 8 billion cubic feet of natural gas per day flowed to the United States, providing Canada with a steady source of export revenue. However, with demand for lower-carbon fuels growing around the world — particularly in Asia — new market potential is opening overseas through liquefied natural gas (LNG). Canada doesn’t have any large-scale LNG export terminals yet, but interest is increasing. A number of projects have been granted export licenses and are in various stages of the regulatory process. However, while decisions on major LNG terminals are still being made, a small foothold has been established in China for Canadian LNG imports by energy services provider, FortisBC. Beginning in late 2017 with a single ISO container, FortisBC has made three shipments of LNG to China. While the first shipment was primarily to test the logistics of shipping overseas using an ISO container, the shipments have increased in size and are spurring more interest in LNG from FortisBC. As more certainty has developed over shipping by ISO container, several more shipments are in the planning process. The most recent shipment to Shanghai, China, with China Energy Reserve and Chemicals Group (CERCG), contained 19 ISO containers with over 300 tonnes of LNG. Shipping LNG using ISO containers may not provide the same volume as large LNG tankers, but it offers customers unparalleled flexibility. LNG in an ISO container will remain in liquid form for up to two and a half months without any additional cooling, and it can be easily transported to any location without either import terminals or pipeline networks. It enables customers to simply move the energy where it needs to go by either truck or rail once the containers are offloaded at any port facility. In this way, shipping via ISO container creates a virtual pipeline that can move natural gas anywhere it is needed for industrial uses or for simple home heating. In 2017, 19 million tonnes of LNG were transported through China by a fleet of approximately 10,000 LNG road tankers. China is in the midst of an energy transition as the country is working feverishly to not only reduce its emissions footprint, but also to improve the country’s air quality. China’s rapid economic growth over the last few decades has been largely reliant on energy from coal-fired generation as a cheap and plentiful form of energy. Although this economic revival has allowed the Chinese economy to flourish, it has also created environmental hazards including acid rain and smog. As such, China has committed to reducing its reliance on coal and is seeking to integrate other cost-effective energy sources with a lower environmental impact. This search has led Chinese companies to LNG. Overall, the GHG emissions of LNG are roughly half those of coal, and its use can help drastically reduce NOX, SOX and particulate matter — key factors in improving air quality. While LNG may come at a bit of a cost premium, the overall investment required to move to natural gas energy systems is low in comparison to many renewable technologies. This mix of value, efficiency and lower environmental impact has led China to embrace natural gas and, by extension, LNG. Although FortisBC may never be the largest global supplier of LNG, the company does have its eye towards the future. Exporting LNG opens a potentially lucrative market for the company through its Tilbury LNG facility, located in Delta, B.C. For the majority of its existence, the 47-year-old facility was primarily used for storage to provide peak-shaving supply for FortisBC’s natural gas customer base, which just last year passed the one million customer mark. However, the company has been expanding its LNG business beyond just storage and into various applications, including commercial fuel for heavy vehicles such as long-haul tractor trailers and marine vessels. Used in these applications, LNG is both cheaper and cleaner than more-conventional fuels such as diesel or gasoline. In fact, FortisBC sees LNG as such an important cornerstone of its business, the company built a CA$400-million expansion of its Tilbury facility. This expansion more than doubles its storage capacity and increases the facility’s liquefaction capacity by a factor of seven. With the project moving to operation in 2018, the company has left the door open for further expansion. FortisBC also continues to support work by WesPac Midstream to develop a marine loading terminal next to the Tilbury plant as early as 2020. This expansion would enhance marine bunkering activity and bulk export shipments. Natural gas, inclusive of LNG, is well positioned to play a prominent role in this transition to a lower-carbon world. The International Energy Agency projects that natural gas use will increase by 45 percent by 2040, while older, more carbon-intensive energy resources decrease. The relatively low cost of natural gas enables customers, whether they be countries or individuals, to meet their energy needs reliably without the same environmental impact as coal or other carbon fuels. As a lower-carbon, less-expensive fuel source that has multiple practical applications from electrical generation to home heating to transportation fuel, natural gas can help countries throughout the world lower their emissions without sacrificing economic stability for its people. While Canada waits for a large-scale LNG export project to come to fruition, Canada’s LNG exports are slowly increasing thanks to FortisBC. The company continues its discussions to ship more LNG — both overseas and domestically — to ensure that more communities have access to low-carbon, reliable, safe energy. Vancouver, BC, Canada - January 3, 2013: Container ship aSeattle BridgeaA enters Vancouver Harbor on January 3, 2013. 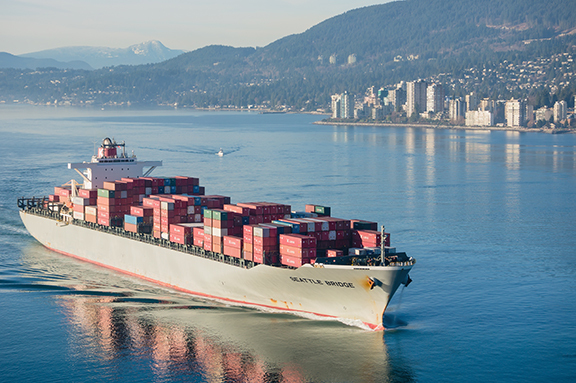 Port Metro Vancouver handles more than 2.5 million cargo containers annually. Sean Beardow is the corporate communications manager at FortisBC. Sean has 15 years of experience in strategic communications, predominantly in the energy industry, in both government and corporate settings.